We’d love your help. Let us know what’s wrong with this preview of Call of the Morrigú by Christy Nicholas. Theodosia Latimer and her grandfather Reginald, were on a mission to discover the past. They were determined to excavate some ancient mounds on thei Would you dare rouse a Goddess? 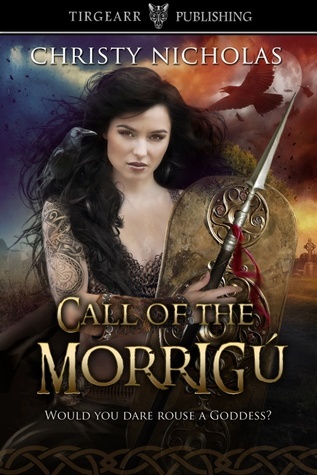 To ask other readers questions about Call of the Morrigú, please sign up. What is your favorite thing about your chosen publishing house? I do really enjoy Irish mythology; it is a newer interest for me so I am still learning about it. Morrígu is a strong goddess from around 1500 years ago when she was imprisioned by priests who saw her as a threat. Fast forward to 1797 & she is back!! It was SO fun to see how Morrígu reacted to the world in the "new time"; the 18th century as well as how she adapted or more like; didn’t adapt. She is a strong Warrior and doesn't understand the passive docile manner of the "modern" women of th I do really enjoy Irish mythology; it is a newer interest for me so I am still learning about it. Morrígu is a strong goddess from around 1500 years ago when she was imprisioned by priests who saw her as a threat. Fast forward to 1797 & she is back!! It was SO fun to see how Morrígu reacted to the world in the "new time"; the 18th century as well as how she adapted or more like; didn’t adapt. She is a strong Warrior and doesn't understand the passive docile manner of the "modern" women of the time. Dosey is a darling lady, she is naïve and very much a woman of her time. A bit of a tomboy at heart, but forced by society to become a proper lady. Dosey’s fiancé Cillian is an petulant & spiteful guy and I don’t think he’s the right man for her. Never had an easier time disliking a character before! In the end it was well written but I was hoping for a bit more ... maybe there is a sequel coming & I will get what I want there! This book turned out to be a page-turner for me. Set in the rebellious period of Irish history 1797-98, the main character, Dosey and her grandfather release an ancient war goddess from her 1300 year captivity. The story intertwines the actual Irish history with old myths, magic and the revitalisation of the goddess Morrigan. Characters are introduced and expanded as the story develops, and although there are to some extent stereotypes - The tomboy, the sorceress, the wise grandfather, the arrogan This book turned out to be a page-turner for me. Characters are introduced and expanded as the story develops, and although there are to some extent stereotypes - The tomboy, the sorceress, the wise grandfather, the arrogant priest, the pretentious snobby lady, and so forth - They are presented with care. I loved the ones I should, and despised the ones I should despise. Introducing a goddess from early medieval times to a more modern society creates humorous situations. Once a strong and powerful goddess, Morrigan has to gather her powers, until she can command a battle again. In the meantime, Dosey learns more about her fiancé and must make her own choices of love. I might have liked to see Dosey mature a little more through the story, she remains somewhat more naïve than I would expect. Some sub-plots are predictable, while other twists to the story are surprising. I love this book with his surprises and mystery. The story is well written, funny and the characters strong and well developed. You will land in a different world where you don't know what will happened. you will live with them, be part of their world. A book for all that love mystery and magic. I received a copy from the author and this is my honest review. An ancient goddess of war, the Morrigan, is woken from her priest-enchanted sleep in the Ireland of Wolfe Tone and the Irish rebellion of 1798. Mistress Theodosia Latimer (Dosey to her friends) is a young Anglo-Irish aristocrat who has to cope with the Morrigan's complete flouting of propriety and habit of wearing breeches - yet they become friends as the de-powered goddess learns how not to frighten the English. When the rebellion breaks out, the Morrigan joins in and wins a battle, only to hav An ancient goddess of war, the Morrigan, is woken from her priest-enchanted sleep in the Ireland of Wolfe Tone and the Irish rebellion of 1798. Mistress Theodosia Latimer (Dosey to her friends) is a young Anglo-Irish aristocrat who has to cope with the Morrigan's complete flouting of propriety and habit of wearing breeches - yet they become friends as the de-powered goddess learns how not to frighten the English. When the rebellion breaks out, the Morrigan joins in and wins a battle, only to have everything thrown away by the foolishness of men. I love Irish mythology. Morrígan is a strong goddess from around 1500 years ago. She was entombed by priests who saw her as a threat. Now it’s 1797 and she is free once more. It was fun to see how Morrígan reacted to the ‘modern’ world in the 18th century. How she adapted or rather didn’t adapt. She is so different from the subdued and restrained women of that time. Dosey is sweet and naïve and very much a woman of her time. A bit of a tomboy at heart, but forced by the rules of society to become a proper lady. Dosey’s fiancé Cillian is quite an unlikeable, petty, spiteful guy and I don’t think he’s the right man for her. The story is entertaining and interesting; the author is a good storyteller. Slowly but steadily the story goes on, in a pleasant way, but about halfway through the book I’m still thinking: “Where is this gonna go?” Funnily that was a good thing; it kept me wondering what would come next. Will Morrígan cause trouble? Will she get out of control? Will her powers grow? Will she become the goddess of war once again? At about three quarters of the book I started to like the story a bit less and the end was a mixture of sad and happy. Somehow I had expected a bit more from that. It left me ever so slightly disappointed after such a compelling story. But all in all a good, solid four stars. I enjoyed this book, it was a great mix of fantasy and historical fiction. I think the author did a good job of taking an interesting cross of history, the goddess being from ancient Ireland, and then the 1700's of the 'present day' and interweaving it into a fascinating story. It was an easy and enjoyable read, with a nice writing style. The characters were likable, particularly Dosey and I think my only complaint was it felt like such a big build up to one battle, but the final one felt almost I enjoyed this book, it was a great mix of fantasy and historical fiction. I think the author did a good job of taking an interesting cross of history, the goddess being from ancient Ireland, and then the 1700's of the 'present day' and interweaving it into a fascinating story. A great read. Dosey and her grandfather unearth a war goddess during excavations of an ancient archeological site. Then they have to figure out what to do with her. A great mix of irish mythology and legend with a little romance. Adventure and laughter from beginning to end. Loved it! I received a free copy of this book and happily and voluntarily choose to leave a review. This review has been hidden because it contains spoilers. To view it, click here. I wish this book was longer. I wanted to know what happened to the main characters after Dosey's grandfather died and how they got to China. Nonetheless a great read. Well written and fast moving. I was sorry to see it end. I hope that there are more Morrigan stories in the future. I love the way the author portrayed the characters and integrated them into her world. They are full of life and strong. The storyline was good and strong with many twists and turns. This authors writing is second to none and I cannot wait to read more from this author. Imagine releasing an ancient goddess and trying to integrate her to society... in the 1700's. A goddess of war, one more comfortable wearing only painted symbols than clothes! Excellent plot, characters have depth, loved it! I'm a sucker for any story of co-mingling gods and mortals, and this tale was particularly fun. Irish goddess of war, Morrigan, is awoken by the sharp yet innocent young Theodosia (Dosey for short) and her beloved grandfather, from a long sleep forced upon her by priests fearful of her power some centuries ago. Morrigan and Dosey develop a wonderful "tough-love" relationship, which is my favorite aspect of the story. Morrigan becomes Dosey's mentor, advising her in the ways of men and women, sexu I'm a sucker for any story of co-mingling gods and mortals, and this tale was particularly fun. Morrigan and Dosey develop a wonderful "tough-love" relationship, which is my favorite aspect of the story. Morrigan becomes Dosey's mentor, advising her in the ways of men and women, sexuality and female power, as Dosey's own mother is mentally ill and unable to fulfill this role for her. Dosey, in return, coaches Morrigan on the strict social rules of 1800's Irish society, which, of course, provides plenty of humor. The only aspect of the story I felt was a bit undeveloped came toward the end, where the fates of Dosey's mother and grandfather were told. The "wrap-up" of the tale seemed a bit rushed. I had to drag myself away from this book several times to attend to life. It was riveting, never boring, and held my interest from beginning to end. And I couldn't wait to get back to it! The characters were both fascinating and sympathetic. I felt invested in what happened to them. Christy Nicholas brought the characters and Irish history to life in a way that was entertaining and engaging. I received an ARC in exchange for my honest opinion and I loved it! I highly recommend this book. Christy Nicholas’s “Call of the Morrigú” is an interesting and exciting story, and readers will be swept away by the characters and plot twists. Read full review in the 2017 October issue of InD'tale Magazine. I honestly went into this book purely for the fact I love mythology. I am so glad I did! Where do I even start? A goddess of war should be enough to intrigue you. What I did enjoy were how well the characters worked together. It had me page turning as fast as I could manage. With witty humour, love and war. Now I need to read more by this author. As I'm the author, I will tell a bit about the process of writing this book. The storyline of waking an immortal or ancient entity isn't a new one, by any means. There's even a Tom Cruise movie coming out next month with a similar line. However, most stories of this type (there are exceptions) have the wakened entity as a monster of irredeemable temper. I wanted to show a Goddess willing to at least try to become 'modern'. Of course, 'try' is the operative word, here. And a 'modern woman' in 1798 As I'm the author, I will tell a bit about the process of writing this book. The storyline of waking an immortal or ancient entity isn't a new one, by any means. There's even a Tom Cruise movie coming out next month with a similar line. However, most stories of this type (there are exceptions) have the wakened entity as a monster of irredeemable temper. I wanted to show a Goddess willing to at least try to become 'modern'. Of course, 'try' is the operative word, here. And a 'modern woman' in 1798 is not exactly something an ancient war goddess would easily emulate. I wasn't as intimately familiar with 1798 as I had been with earlier or later periods in Irish history, and had to do a lot of research into the politics and warfare of the time, as well as the personalities involved. It was fascinating research, and I do hope I did it justice. While there are some strong sexual themes and strong descriptions of violence, any actual sexual activity in this book takes place off-screen. This is my 2nd delighted read of this author, the 1st being book #4 on her Druid's Brooch series: https://www.goodreads.com/review/show... . Nicholas displays a deft knack of drawing-in young readers, what with short sentences and plentiful--if familiar--adjectives. Not until mid-3rd-chapter did I find a few adjectives of the 3-syllable type...but that's perfect for middle-schoolers. This one begins a bit like the classic "Sleepy Hollow" followed by the bit more-involved "Fall of the House of Us This is my 2nd delighted read of this author, the 1st being book #4 on her Druid's Brooch series: https://www.goodreads.com/review/show... . Nicholas displays a deft knack of drawing-in young readers, what with short sentences and plentiful--if familiar--adjectives. Not until mid-3rd-chapter did I find a few adjectives of the 3-syllable type...but that's perfect for middle-schoolers. This one begins a bit like the classic "Sleepy Hollow" followed by the bit more-involved "Fall of the House of Usher," what with the delirious madwoman. I didn't feel quite as entranced by this opening as I did with the Brooch book though, perhaps as that is for a more high school/late teen readership I think, whereas this is for younger readers, imo. In both, herbology is an enjoyable vocation of a major character, and I applaud how likeable Nicholas' treatment of this is.